Mayor Kevin Faulconer said Thursday he will push for completion of a long-delayed public gathering space in front of Horton Plaza. At the San Diego Press Club’s Newsmaker Breakfast, he blamed the demise of redevelopment agencies statewide for the year-long holdup in construction of Horton Plaza Park on the former Robinsons-May/Planet Hollywood site at Broadway and Fourth Avenue. 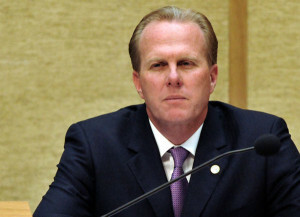 “We will get that park done,” Faulconer said. Doing away with redevelopment agencies was “a tragic mistake for the state of California,” Faulconer said. He said the park at Horton Plaza, where civic officials hope to stage hundreds of public events annually, got caught up in the transformation, which resulted in construction bids coming in higher than anticipated. He also promised to complete the first phase of the downtown waterfront renovation, which was also started under redevelopment. Faulconer reiterated that he was a “strong opponent” of City Council- approved zoning changes in Barrio Logan — which mandate that a commercial buffer zone separates Naval Base San Diego, the 10th Avenue Marine Terminal, shipyards and other major industrial uses from homes — because they would change the rights of businesses that provide supplies to the maritime industry and put thousands of jobs in jeopardy. Area shipyards collected enough signatures to force a public vote on the issue, which will appear on the ballot as propositions B and C.
Faulconer also spoke out against a proposed ballot initiative that would increase San Diego’s minimum wage to $13.09 per hour over the next three years, which is higher than state’s minimum wage hike. Although Faulconer wants employees to make as much as they can, he said a wage higher than that in other areas would put the city at a disadvantage, and would have a negative effect on small business owners. The city should do everything possible to promote small businesses that have been struggling in the recession, but should also enact a fair process without favoritism, he said. Faulconer also touched on keeping the San Diego Chargers in town, using a financial plan that would protect the city. However, any solution would be placed on the ballot. He also recapped his first 90 days in office, which included putting an end to all city emails being deleted after a couple of years and appointing Shelley Zimmerman as police chief, and outlined some of what is included in his nearly $3 billion budget proposal for the upcoming fiscal year. His spending plan calls for longer library hours, more fire academies, extra money for road repairs and other infrastructure projects, funding for fire protection in southeast San Diego and an upped amount for recruiting and retaining police officers.